No matter how fast the pace on my morning walk, I always make a dead stop in front of one house, the one that has three paperbark maples on the front lawn. No matter what the season, there is always something special on these small trees: the bark in the winter, the flowers in the spring, the shape in the summer or the blazing leaf colour in the fall. I want to reach out and touch it. 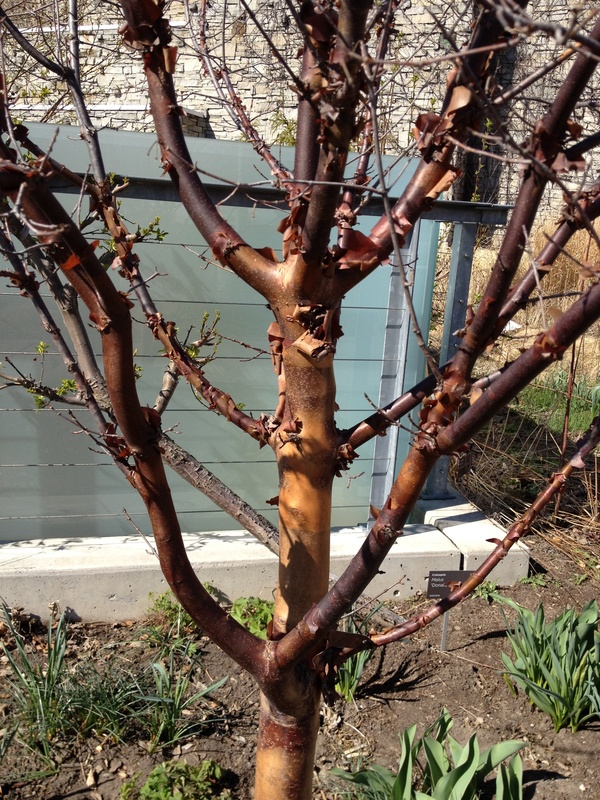 Acer griseum, or paperbark maple, is a real showstopper. It can be the ornamental focal point of a garden and provides interest year-round. Most striking, and most obvious, is its dramatic exfoliating bark. It has shades of cinnamon red and brown throughout the year, peels in thin sheets and also looks smoothly polished in other places. This alone would be enough in a plant to make it a star, but there is much more. In early spring small yellow flowers are in bloom, foliage is green in spring and summer, and then explodes into brilliant orange and red in the autumn providing dramatic colour in the garden. That is still not all that makes it a favourite tree. It is a small maple, so ideal for city.